Explore peerless comfort by IMG. Exquisite attention to detail, and old world craftsmanship, combined to bring ultimate relaxation, made just for you. Specializing in recliners, chair ottoman relaxers, home theater sectionals, sofas and loveseats. Each of our unique modern and contemporary designed recliners bring a plethora of unique features. From electronic reclining mechanisms to telescoping headrests, you're sure to find the perfect relaxer to fit your needs. IMG is located in Sykkylven, Norway - famous for its steep mountains and deep fjords as well as the production and development center for Scandanavian comfort recliners. As part of the Ekornes group of Norway, IMG's passion is to engineer and design furniture that delivers world leading comfort and back-saving ergonomic support. Our vision is to create exclusive designs that deliver an exceptioal combination of comfort, quality, and unsurpassed value. Within every chair and sofa - you will discover IMG's drive for excellence. Our philosophy combines science of body correct ergonomics with old-world craftsmanship and state of the art technology. Our entire range is designed, engineered, and tested by our Norwegian product development team and produced in our own vertically integrated manufacturing companies in Vietnam and Thailand. IMG pursues perfection through attracting experienced people and partners who share our vision and love of furniture. We strive to create an atmosphere of inventiveness and optimism - with a relentless purpose to improve and create better tomorrows. It never ends. We never stop innovating and improving. That's a belief we've built our company on. And we're dedicated to applying that philosophy to everything we do. 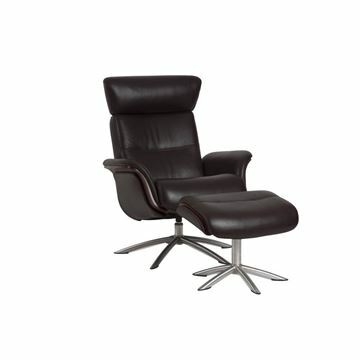 The Boss 387 Large Recliner by IMG Comfort, in stock in two premium top grain leather colors. Comes standard with full chaise style leg rest! You can also select between a manual or motorized reclining mechanism. The headrest tilts as well as telescopes, making it easy too find the exact neck position for the best comfort. Because the leather is a premium top grain protected leather, it is very user friendly, durable, and easy to clean. The pillow-top arm design is fully padded, which adds great comfort to your relaxation experience in this design. 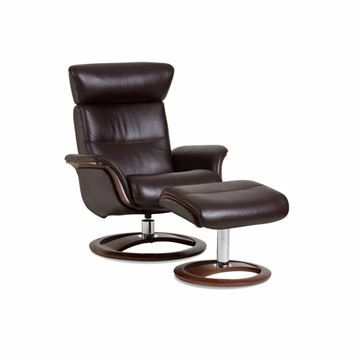 The Boss 287 Standard Size Recliner by IMG Comfort is in stock in two premium top grain leather colors. It comes standard with a full chaise style leg rest! Also select between a manual or motorized reclining mechanism. The headrest tilts as well as telescopes, making it easy too find the exact neck position for the best comfort. Because the leather is a premium top grain protected leather, it is very user friendly, durable, and easy to clean. The pillow-top arm design is fully padded, which adds great comfort to your relaxation experience in this design. The Boss Lift Chair, by IMG Comfort. The Boss features a unique and tremendously comfortable pillow-top arm, fully padded. The padding tapers slightly from top to bottom, following the arm design. Combined with a full chaise style leg rest and telescoping/tilting headrest, the Boss is a supremely comfortable contemporary recliner. The Lift Mechanism provides a full range of height, making getting into and out of this chair a simple automated task. Scroll down to see more details and cover offerings. The Boss Power Motion Sofas and Sectionals, by IMG Comfort. Available in many configurations, and with manual or motorized reclining mechanisms. There is a wide variety of fabrics and leathers. All prices shown reflect motorized mechanisms. Contact us for pricing with manual mechanisms. In Stock in two different leather colors. 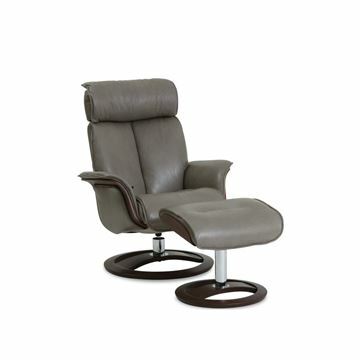 The Chelsea Large Sized Power Motion Recliner is made by IMG Comfort. The Chelsea features a unique padded key shape arm, enhanced by a tapering effect as the arm extends lower towards the seat. It gives the recliner a luxuriously comfortable and contemporary look. The lateral tufted back rest is ergonomically formed to provide wonderful complete back support. Combined with a full chaise style leg rest and tilting headrest, the Chelsea is a supremely comfortable contemporary recliner. The Chelsea Recliner is in stock in two different leather colors. 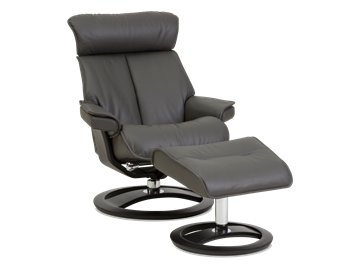 Features a full chaise style leg rest and an all power reclining mechanism. The Chelsea features a unique padded key shape arm, enhanced by a tapering effect as the arm extends lower towards the seat. It gives the recliner a luxuriously comfortable and contemporary look. The lateral tufted back rest is ergonomically formed to provide wonderful complete back support. Combined with a full chaise style leg rest and tilting headrest, the Chelsea is a supremely comfortable contemporary recliner. The Chelsea Lift Recliner, by IMG Comfort. Available in two sizes and many different leathers or fabrics. The Chelsea features a unique padded plateau arm, enhanced by a tapering effect as the arm extends lower towards the seat. It gives the recliner a luxuriously comfortable and contemporary look. The lateral tufted back rest is ergonomically formed to provide wonderful complete back support. Combined with a full chaise style leg rest and tilting headrest, the Chelsea is a supremely comfortable contemporary recliner. IMG Cortina Compact Chair and Ottoman | 29"
Cortina Compact Size Chair and Ottoman by IMG Norway. Enjoy a truly stressless relaxing experience every time you sit down and stretch out thanks to IMG's ergonomic design, premium quality, and customized options. Enjoy selecting from a variety of premium quality fabrics, leathers, and wood finishes to best match your room setting. IMG Cortina Large Chair and Ottoman | 33"
Cortina Large Size Chair and Ottoman by IMG Norway. Enjoy a truly relaxing experience every time you sit down and stretch out thanks to IMG's ergonomic design, premium quality, and customized options. Enjoy selecting from a variety of premium quality fabrics, leathers, and wood finishes to best match your room setting. IMG Cortina Standard Chair and Ottoman | 31"
Cortina Standard Size Chair and Ottoman by IMG Norway. Enjoy a truly stressless relaxing experience every time you sit down and stretch out thanks to IMG's ergonomic design, premium quality, and customized options. Enjoy selecting from a variety of premium quality fabrics, leathers, and wood finishes to best match your room setting. The Divani Compact Size Recliner by IMG Comfort. Motorized and in stock in three different premium top grain leathers. Only the motorized version is in stock in the compact size. The Divani features a sleek tapering arm design, giving the recliner a very contemporary look. Lateral tufted back rest is ergonomically formed to provide wonderful complete back support. Combined with a full chaise style leg rest and telescoping/tilting headrest, the Divani is a supremely comfortable contemporary recliner. 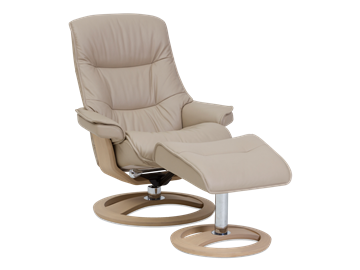 The Divani Large Multi-function Lift Recliner by IMG Comfort. This recliner rests soundly on the floor, and does not swivel nor rock. The mechanism is capable of positioning you into a nearly upright standing position, making it easy to assist in getting into and out of the chair. The back rest and leg rest can be operated independent of each other, allowing for a simple process to find the most comfortable position for resting your legs and your upper body. The mechanism is operated with a simple to operate control that is wired directly to the chair and is stowed in a side storage pocket when not needed. The Divani Large Recliner by IMG Comfort. Manual and motorized versions are in stock in three different leather colors. The Divani features a sleek tapering arm design, giving the recliner a very contemporary look. Lateral tufted back rest is ergonomically formed to provide wonderful complete back support. Combined with a full chaise style leg rest and telescoping/tilting headrest, the Divani is a supremely comfortable contemporary recliner. The Divani Standard Size Recliner by IMG Comfort. Motorized and manual versions are in stock in three different premium top grain leathers. The Divani features a sleek tapering arm design, giving the recliner a very contemporary look. Lateral tufted back rest is ergonomically formed to provide wonderful complete back support. Combined with a full chaise style leg rest and telescoping/tilting headrest, the Divani is a supremely comfortable contemporary recliner. IMG Novel Compact Chair and Ottoman | 29"
Novel Compact Size Chair and Ottoman by IMG Norway. The Novel offers a wonderfully relaxing experience every time you sit down and stretch out thanks to IMG's ergonomic design, premium quality, and customized options. The Novel's more pillow back design embraces your back and body, truly supporting your head, neck, and torso. Enjoy selecting from a variety of premium quality fabrics, leathers, and wood finishes to best match your room setting. IMG Novel Large Chair and Ottoman | 33"
Novel Large Size Chair and Ottoman by IMG Norway. The largest of the Novel series, offering a relaxing comfortable experience every time you sit down and stretch out thanks to IMG's ergonomic design, premium quality, and customized options. The Novel's more pillow back design embraces your back and body, truly supporting your head, neck, and torso. Enjoy selecting from a variety of premium quality fabrics, leathers, and wood finishes to best match your room setting. In Stock in leather Sauvage Charcoal. IMG Novel Standard Chair and Ottoman | 31"
Novel Standard Size Chair and Ottoman by IMG Norway. Slightly larger than the compact version, the Novel standard size offers a wonderfully relaxing experience every time you sit down and stretch out thanks to IMG's ergonomic design, premium quality, and customized options. The Novel's more pillow back design embraces your back and body, truly supporting your head, neck, and torso. Enjoy selecting from a variety of premium quality fabrics, leathers, and wood finishes to best match your room setting. The Peak Standard Size Recliner by IMG Comfort. IN STOCK WITH ESPRESSO WOOD FINISH AND IN TWO LEATHER COLORS!! The Peak features a truly unique wood element, enhanced by open sides. The combination gives the overall chair a modern and sophisticated appeal. The wood elements are topped with a plush arm pad, offering great comfort when resting. Please see below for more details, sizes, and options. The Peak Wood Arm Lift Recliner, by IMG Comfort. Available in two sizes and many different leathers or fabrics. The Peak Lift Chair features a modern open style arm crafted in wood with a soft padded arm rest. The lateral tufted back rest is ergonomically formed to provide wonderful complete back support. Combined with a full chaise style leg rest and tilting telescoping headrest, the Peak is a supremely comfortable contemporary recliner. Easy to operate with simple to understand remote control that is attached to the chair. The Space 55.55 Chair and Ottoman by IMG Comfort. The In Stock chair is in black leather color Trend Tuxedo, with dark walnut wood accents, and with the IMG Brushed Metal Base. The ergonomic curvature of the back and telescoping/tilting headrest make this design extremely comfortable. The Space chair and ottoman features a gently curved wood base element, forming the shape and foundation for both the chair as well as the ottoman. Space is a sophisticated and beautiful modern adaptation of a classic mid-century modern design. The Space 58.58 Chair and Ottoman by IMG Comfort. In Stock in leather Sauvage Dove. Sauvage is a luxuriously soft leather, featuring rich and deep color tone. The seat and back are ergonomically shaped for supreme comfort. The Space features a gently curved wood frame lower element, forming the shape and foundation for the chair. The same design concept carries through to the ottoman. The vertical center seam in the back cushion forms a natural ergonomic cushion designed to allow a deeper more enveloping sit in the chair. We are able to combine different covers and wood finishes to perfectly match the overall look to your room, and can help you to make selections if you'd like us to. Space is a sophisticated and beautiful modern adaptation of a classic mid-century modern design. Please see below for more details, sizes, and options. The Verona Recliner, by IMG Comfort. The Large Size is in stock in leather Sauvage Truffle. The leather is a deep and rich brown color, with a soft supple feel to the touch. The Verona features a unique plush padded arm, enhanced by a tapering plush back rest cushion. It gives the recliner an extremely cushy and luxuriously comfortable sit. The lateral tufted back rest is ergonomically formed to provide wonderful complete back support. Combined with a full chaise style leg rest and tilting headrest, the Verona is a supremely comfortable contemporary recliner. The mechanism is available as manual, motorized, or motorized+headrest and lumbar backrest. Please scroll down to see more specific details about the Verona. 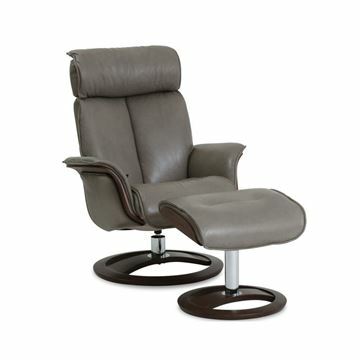 The IMG Verona Recliner, by IMG Comfort. The Large Size is in stock in leather Trend Sand. The leather is a warm neutral tan color, with a soft supple feel to the touch. IMG's Trend leathers are all protected leathers, very user friendly and easy to clean. The Verona features a unique plush padded arm, enhanced by a tapering plush back rest cushion. It gives the recliner an extremely cushy and luxuriously comfortable sit. The lateral tufted back rest is ergonomically formed to provide wonderful complete back support. Combined with a full chaise style leg rest and tilting headrest, the Verona is a supremely comfortable contemporary recliner. The mechanism is available as manual or motorized. Please scroll down to see more specific details about the Verona. 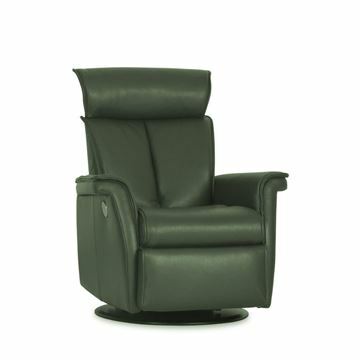 The Verona Recliner, by IMG Comfort. The Standard Size is in stock in leather Sauvage Truffle. The leather is a deep and rich brown color, with a soft supple feel to the touch. The Verona features a unique plush padded arm, enhanced by a tapering plush back rest cushion. It gives the recliner an extremely cushy and luxuriously comfortable sit. The lateral tufted back rest is ergonomically formed to provide wonderful complete back support. Combined with a full chaise style leg rest and tilting headrest, the Verona is a supremely comfortable contemporary recliner. The mechanism is available as manual or motorized. Please scroll down to see more specific details about the Verona. 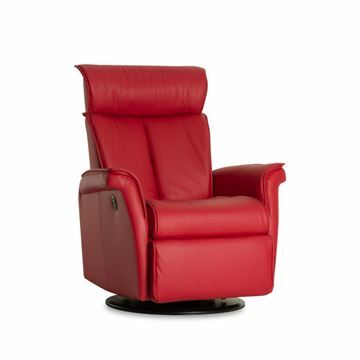 The Verona Recliner, by IMG Comfort. The Standard Size is in stock in leather Trend Sand. The leather is a warm neutral tan color, with a soft supple feel to the touch. IMG's Trend leathers are all protected leathers, very user friendly and easy to clean. The Verona features a unique plush padded arm, enhanced by a tapering plush back rest cushion. It gives the recliner an extremely cushy and luxuriously comfortable sit. The lateral tufted back rest is ergonomically formed to provide wonderful complete back support. Combined with a full chaise style leg rest and tilting headrest, the Verona is a supremely comfortable contemporary recliner. The mechanism is available as manual or motorized. Please scroll down to see more specific details about the Verona. 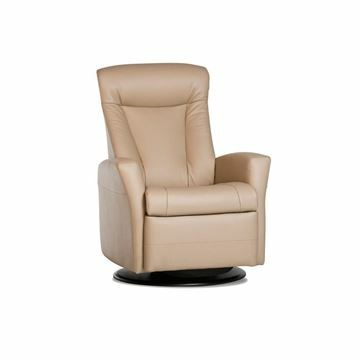 The Verona Lift Relax Recliner, by IMG Comfort. A convenient lift mechanism enhances your ease of use to get into and out of the recliner. The Verona features a unique plush padded arm, enhanced by a tapering plush back rest cushion. It gives the recliner an extremely cushy and luxuriously comfortable sit. The lateral tufted back rest is ergonomically formed to provide wonderful complete back support. Combined with a full chaise style leg rest and tilting headrest, the Verona is a supremely comfortable contemporary recliner. Scroll down to see more details and cover offerings.